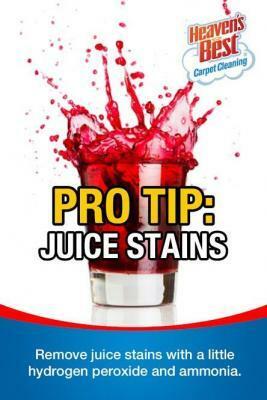 Here's a great way to remove Kool Aid, Juice, and Fruit Stains from Carpets in Birmingham AL. First, try to Act Immediately! If you catch the spill or stain before it sets in or dries, it is much easier to get out. As soon as you realize a spill has occurred, do the following 3 Steps to absorb the spot before it soaks in. 1. Blot up as much of the liquid as soon as possible with a clean towel or paper towels. 2. Apply a damp white towel or paper towel to the spot. 3. Blot up as much of the stain with the towels as possible. DO NOT RUB! Now, mix up a solution of 1/2 cup hydrogen peroxide and 1 tsp. ammonia. Apply this to the spot. Place several clean white towels on top of it and then weight it down with a book, weight, or heavy object. Let it stand for 2 to 3 hours. If the stain is still there, repeat the process with another application of hydrogen peroxide solution. When the spot is clean, blot dry any remaining solution with paper towels. If necessary, you can stand or kneel on the paper towels to absorb the remaining liquid. If this sounds too time consuming and difficult, call the professionals at Heaven’s Best Carpet Cleaning. We have professional strength spot and stain removers that will remove Kool-Aid, Juice and Fruit Stains from your Carpets in Birmingham, AL. We will make your carpets look almost like new and they will be dry in about 1 hour! Call Heaven’s Best at (205) 618-9150 to schedule a Carpet Cleaning Today! Nothing looks or smells better than soft clean Carpets.